Eldar Aliev has earned an international reputation as a dancer, choreographer and artistic director. His thirteen-year career as a Principal Dancer with the Kirov Ballet distinguished him not only as a technically superb classical and contemporary dancer but also as a creative dancer whose interpretations ignited the full range of roles he performed. Dancing with the Kirov and a number of world-renowned ballet tours including the Galaxy of Russian Ballet and the Superstars of Russian Ballet, Mr. Aliev has performed in over thirty countries. His performing career also includes starring appearances with the Bolshoi Ballet and The Australian Ballet. Mr. Aliev’s career is living up to the prediction of dance critic Clive Barnes who, writing in the New York Post shortly after Mr. Aliev moved from Russia to the United States, said, “[His] rare versatility and ability to probe beneath the surface of his roles make Mr. Aliev a truly exceptional artist, [who] will contribute much to the future of dance in this country.” Mr. Aliev’s recent engagements include Visiting Artistic Advisor for Cincinnati Ballet, master classes at the Royal Swedish Ballet and National Ballet of Canada, guest speaker at the Ballet Talks series at Harvard University, Ballet Master at Boston Ballet and his current role as Interim Dean at the Boston Ballet Center for Dance Education. Previously, as Artistic Director of Ballet Internationale—Indianapolis, Mr. Aliev transformed Indiana’s only professional ballet company into a world-class ensemble, performing to enthusiastic audiences in Beijing, Los Angeles, New York, Taipei, Montreal and other cities around the U.S. and abroad. His commitment to the highest artistic standards and his inspiring leadership throughout his fourteen years with Ballet Internationale, enabled Mr. Aliev to build an artistic staff of international acclaim and recruit extraordinary dancers from around the world. Mr. Aliev’s choreographic debut of the full length ballet A Thousand and One Nights was acclaimed as a tour de force in the world of dance. Patricia Barnes of Shinshokan Dance Magazine raved, “When the curtain goes up on the premiere of a new ballet to spontaneous applause, and when that applause is sustained by the audience throughout the evening, then one just knows that the creative talents responsible, choreographer, designers as well as dancers themselves, have a hit on their hands. This is what happily occurred at Ballet Internationale’s A Thousand and One Nights…” His inventive and magical version of the holiday classic, The Nutcracker, has fast become a favorite of presenters throughout the United States. Audiences have responded with standing ovations to Mr. Aliev’s unique interpretation of the time-honored classic in which he deftly expanded the libretto. 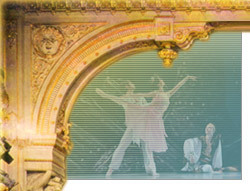 Aliev’s Nutcracker has also become a featured holiday show on public television. Since its debut in 2003, the number of markets presenting the festive production has grown each year, and includes stations in New York, Los Angeles, Chicago and Atlanta. Mr. Aliev’s fusion of classical and contemporary styles adds excitement and freshness to his creations. His provocative production of The Firebird garnered immediate praise in both the national press and the international ballet media. His exuberant Le Corsaire gives new life to the time-honored masterwork while showcasing the dance techniques of our time. In addition to his original choreographic work, Aliev has staged an extensive list of classical ballets to the delight of both audiences and critics. These include The Sleeping Beauty, Swan Lake, Don Quixote, Giselle, Paquita, Raymonda and for the Theatre Colon, the National Theatre of Argentina, Les Sylphides. Mr. Aliev is a frequent adjudicator of international ballet competitions and has served as jurist for two inaugural ballet competitions, the 2002 International Ballet Competition in Prague and the 2004 Seoul International Dance Competition. He returned to Seoul, South Korea in 2005 for his second consecutive year, serving as both jurist and member of the International Regulations Committee. Mr. Aliev has also created a reputation as an accomplished director of international gala performances, presenting the stars of world-leading companies. At the prestigious annual Gala Des Etoiles in Montreal, he is the sole coach of performers as well as a member of the artistic advisory board. Eldar Aliev choreographer, Eldar, Aliev. Copyright © 2006 - Theatre Link, Inc.